Rocks Gems & Minerals partworks reissue? 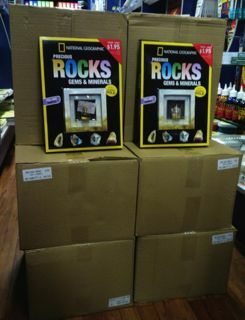 Like many newsagents I suspect I was surprised to see the Rocks, Gems & Minerals partwork reissued yesterday – even though it did not look like a reissue thanks to new packaging and National Geographic branding. I don’t remember it looking like this last time around. The stock code in the EDI file points to the previous issue so this is connected to the previous rocks title we received. 72 copies, that’s what we received in one of our stores. What do other newsagents think? If we had control of our ordering, we’d have asked for 30. here’s what galls me and, I am sure, most newsagents. We have to pay to return the unsold stock. We are penalised for a poor scale out decision, we have to pay for someone else’s mistake. It’s a disgusting impost on any business let alone small business newsagents at the end of the magazine food chain. And magazine publishers wonder why some newsagents are actively and openly discussing exiting the category altogether. Supply is the problem. It is drowning the newsagency channel and no one in authority appears prepared to do anything about it. The result will be even more magazine sales lost from the newsagency channel to supermarkets. Category: magazine distribution · Magazine oversupply · magazines · partworks · Ugh! Rocks, Crochet, Dolls Houses and Pocket watches – 4 re issues in 3 weeks. Have we run out of things to sell? Sold 30 first time around, so we are sent 96 on the re-issue! This is nothing but a farce. I don’t mind reissues if they sell. Given the bulk of these things, we need to sell at least 90% of what we get to break even. Complain. If you have access to a small business commissioner – complain to them. Write to the ACCC with your evidence. Write to the distributor direct. The more all of us do this the better. These complaints have to come from newsagents themselves. Not displaying Doll Houses, Crochet, or Rocks. If customers ask for them, we are pulling them out of the boxes. I have been surprised at the pocket watches. We have stocked out of both issues. small country town, sent me 60???? we stopped put aways years ago. AS our floor space shrinks over the years to come so will the magazine space. When will the penny drop with newsagents lets follow the lead by the supermarkets and just sell the top 50 to 100 titles. and convert the old mag space to say a dedicated “Gift Area/store” within a store with a min 50/60% GP. Made twice the profit last week from gift sales of $3,000 @ 55% compared to mag sales $3400 @ 25% Magazines too labour intensive for such a small margin and shocking sell through rate! Another “con job” by the distributors/publishers. someone has got thousands left over from last time around. I have gone from 1900 pockets to 750 pockets and I’m thinking of reducing again. Cashflow is our killer and we can’t control it. I would be happy setting my own supply for partworks, I know what sells here and what doesn’t. We received 40 part 1 of Crochet and have sold out but unless they can send more stock this week it’s a waste of time reordering. Only got 5 watches, could have done with more but by the time we can get our order right the interest will have waned and 5 will probably be too many. As for the other recent part works, far more than I would have ordered and far more than we will sell. Give newsagents the option beforehand to place their order, that can’t be to difficult can it? I don’t have a problem with re-issues, but the last few have been FAR too close together. We simply don’t have the room to display them all. Spread them out. Give each one the opportunity to be allocated the display space they need. I’m not a newsagency owner or anything, just a customer in search of 60 issues of the first ‘Rocks Gems & Minerals partworks’ issue – the one with the gold flakes in the glass jar. If any of you have large quantities you are looking to sell can you please let me know. I am in the Brisbane area, but I am willing to consider paying for shipping provided it is not too costly. Note came through today that there is already a 1000 on back order. Obviously the wrong stores got the wrong quantities. Its a shame Allan – we would have ordered plenty extra. We’ve ploughed through our initial 73 in less than 5 days. Hi – I am an avid collector – having collected the original Treasures Of The Earth with the smaller specimens. I am after just the ones I missed out on from the last version of these larger specimens – starting with issue 5. Any Adelaide newsagent who is willing to take orders for just the ones I need, contact me. My daughter starting collecting but our local Melb newsagent has had any since issue 3 and they only got 4 of them so she missed out. We’ve been waiting weeks and still nothing.. What is going on with this promo?.. We are desperate for a copy of ed 3. Does anyone have one? My number 17 AZURITE didnt come in its little case and foam like all the others, how can I get one? all the others sit nicely in their own little cases with their name in the big show case. I need to somehow get one can anyone help please. Trish you’d need to contact the publisher. #17 have all come missing this part, when I spoke to NDC they said we could report them damaged and re-order, however no stock on hand, and the guy on the phone told me that one newsagents replacement stock was still missing the tray. Some unhappy customers at our end. So far everyone we receive is in a damaged case , so we have put this down to being normal ,they end up in a display case anyway ,so is the box really needed ? I have 5 regular putaways, every week I receive 3, this week 2. I sometimes buy from another newsagent who gets 2 extras, this week he had 1. I also had 1 customer who complained about the missing box and she wanted me to order a replacement, I will show her these comments first. I was really making an effort to embrace part works but I’ve just about had it. What’s the point of the distributor getting our sales data? Does anyone know how many there is in the series? As for number 17 I phoned Bissett Australia and they sent out the little holder and foam for free. Well i feel ripped off. i collected all 80 issues for the kids costing $11.95 each issue. Now they are advertising on tv the same rocks for $1.95. OFF TO A GREAT START issue 2 no stock turns up , oh I did get the paperwork telling mew I should have received 12 but to call network . So once again a shortage on stock . I am just about to call it quits on partworks . We received issue 3 today. Invoiced for issue 2. We have not received issue 2. Help me identify the exact Liquid in these Glass Vile’s? As I dont want my Kids Drinking this! Hope to hear from you? Thx Daniel..
Daniel, I encourage you to contact the publisher. Does anyone have Issue 8 – Fuchsite? ?